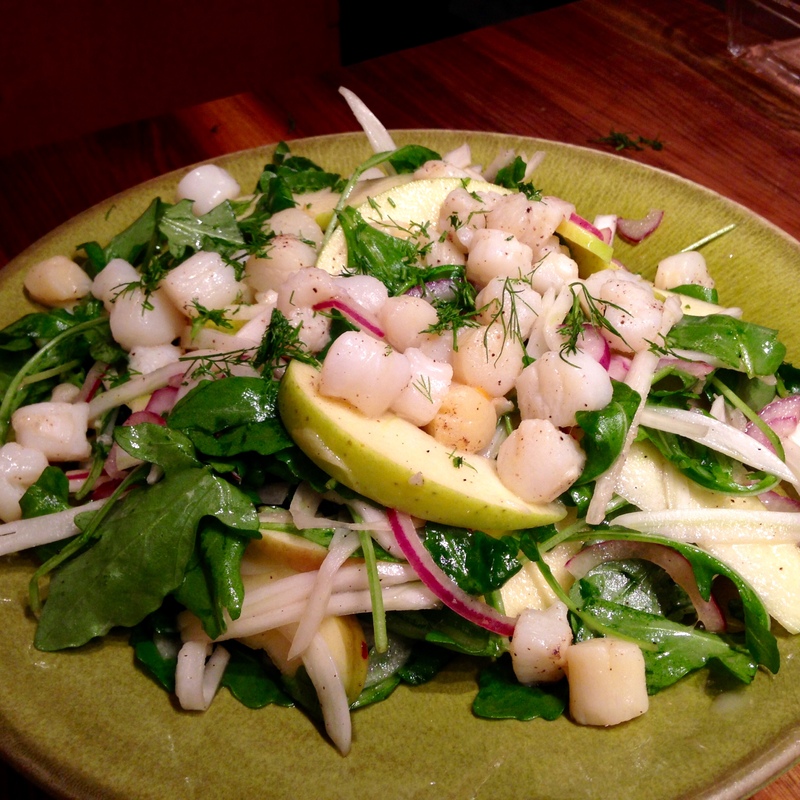 Last night’s dinner was bay scallops atop a fennel, arugula, Golden Delicious and red onion salad dressed with a sesame oil and rice wine vinaigrette. The peppery arugula and the bite of the red onion helped to offset all that sweet. But something was missing. Were I a fancy chef, one of my kitchen crew would have arrived early that morning to prepare some puffed rice to add a dry, crispy element and my sommelier would have paired it with a crisp, lemony Sancerre. Alas, I am not a fancy chef. And so I ate my salad as is, standing at the kitchen counter, with a glass of the Pinot Noir that was already open. You could do worse for a Tuesday. 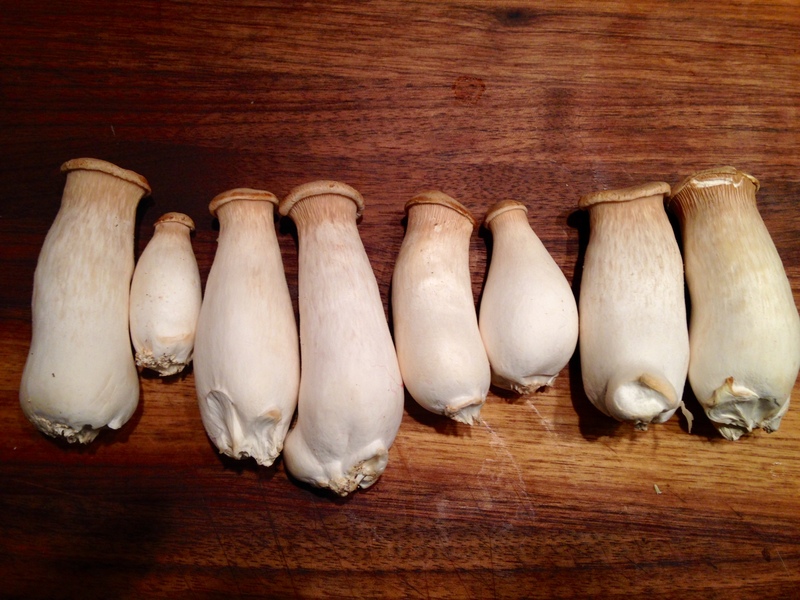 I arrived home tonight bearing king oyster mushrooms that one of my coworkers grew in quart jars full of coffee grounds in his apartment. Jorge left the mushrooms in the office fridge, inviting us to help ourselves, provided we cooked them up and reported back on how they tasted. Um, they were good. Really good. The king oyster mushroom’s unique shape–coupled with memories of last night’s good but not great dinner–inspired me to prepare them as though they were scallops. I’d be willing to bet that this technique would work well with all manners of fancy mushrooms. But it will lack a certain surreality. Set a large pot of water to boil with plenty of salt. Bring the butter and oil up to medium heat in a large pan. Add you leeks and sauté, stirring continuously, for a couple of minutes. Add the mushrooms, red pepper, garlic and thyme. Cook, flipping the mushrooms occasionally, until they are golden. Deglaze the pan with the vermouth and allow to evaporate. Once the water boils, add the pasta and cook until al dente. Scoop the pappardelle directly into your pan, allowing some of the cooking water to transfer. Mix the pasta into the mushrooms and then turn off the heat. Add the crème fraîche, arugula, lemon zest, and salt and pepper to taste. Stir until the arugula is wilted but still bright green, adding additional pasta water as needed to keep it loose but not soupy. This should make enough for your dinner tonight and Jorge’s lunch tomorrow. Alternately, we could all agree not to tell Jorge and keep both servings for ourselves. 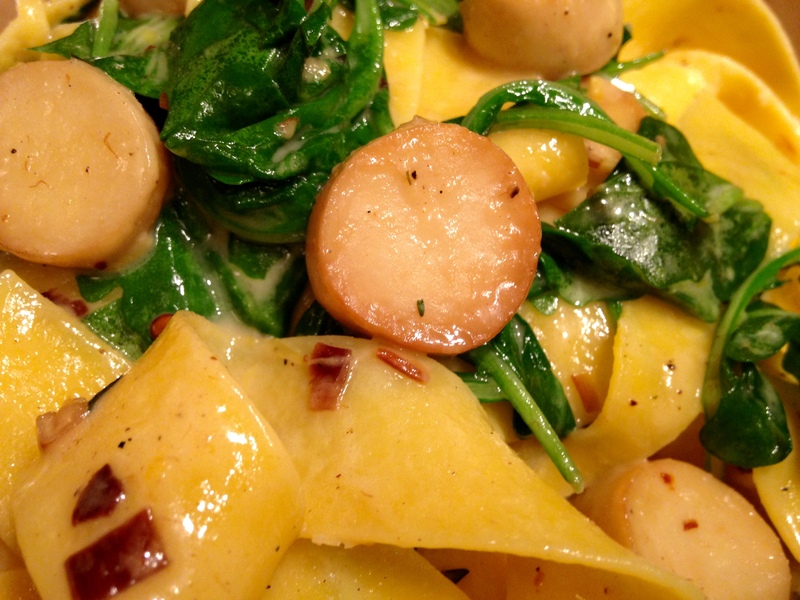 This entry was posted in main courses, vegetarian and tagged arugula, mushrooms, pasta by Jasmine Nielsen. Bookmark the permalink.